The classic USS Enterprise NCC-1701 gets a sleek, updated look! Includes Star Trek: The Original Series sound effects. Exclusive HD edition with details from the re-mastered episodes. Light-up action and the voice of William Shatner! From the classic Star Trek TV series, comes Captain Kirk's legendary USS Enterprise NCC-1701! The highly detailed ship is about 14-inches long and features light-up action and an optional display base, plus original series sound effects… including the voice of William Shatner. This exclusive HD version even showcases additional details as they appear in the re-mastered episodes of Star Trek: The Original Series! Please note: Packaging says "16-inches long," but this item is actually 14-inches long. 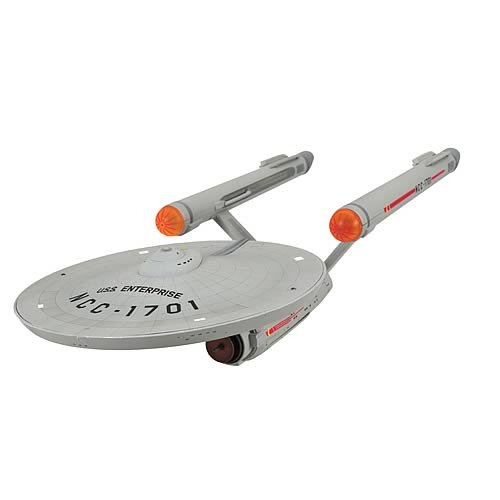 The Star Trek TOS Enterprise NCC-1701 HD Edition Vehicle uses 3x "AAA" batteries that come included.